Dazzling and delightful, this bold and colorful flower bouquet is set to impress with its high impact look and graceful styling. 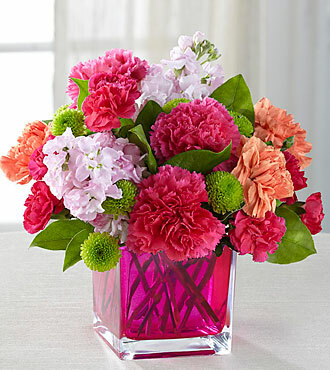 Orange roses, hot pink carnations, orange carnations, pale pink gilly flower, hot pink mini carnations, green button poms, and lush greens are beautifully arranged in a raspberry pink glass cubed vase to create a rush of fun and warm wishes to send straight to your recipients door. Ready to celebrate a birthday, extend your congratulations wishes, or to simply say thank you!